As a forerunner to McMillan & Wife and Hart to Hart, the sophisticated husband and wife team of Jerry and Pamela North work to investigate various crimes and solve them before the police do. Jerry (Richard Denning) is a mystery magazine publisher and amateur sleuth. 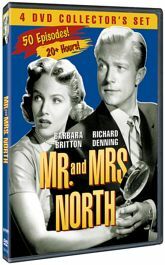 His better half Pamela (Barbara Britton) maintains the lead in the couple's adventures. While cases were being solved, a touch of humor permeated the proceedings. The series, which originated on radio, was on television from 1952 - 1954.